For the bustling city of Las Vegas in Nevada, tourism is big business and is the main livelihood that keeps this place alive. the tourism alive in Las Vegas, Nevada. ... Golf is another highlight in Las Vegas, Nevada that keeps many people around the city when they need a break from the fast pace of the strip.Walk into any travel agent and the tourism packages that are available for Las Vegas, Nevada is incredible. Hotels, flights and coupons make up the packages offered and there is not a better city that you will find to vacation in where the excitement never stops. 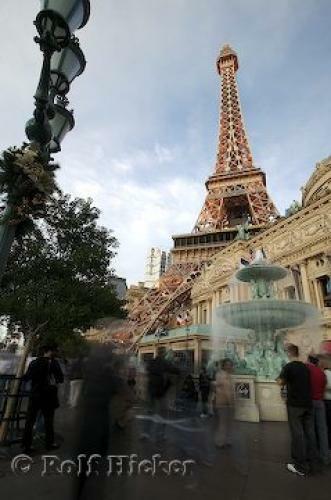 Las Vegas was once a place geared towards adults but in today's world there are many shows that are meant for kids.Paris Las Vegas, Eiffel Tower, Vegas Strip, Las Vegas, Nevada, USA, North America. I photographed this photo with the digital SLR camera model Canon EOS-1DS, aperture of f/22.0, exposure time of 2/1 sec. on ISO 50, as always I used a original Canon Lens, the focus lenght for this picture was 16mm.